What if Wolverine and Batman had a baby? They'd have serious psychological problems and these awesome claws. The Internet webseries Man at Arms has tackled all kinds of real-life weapons, like Thor's hammer, but now they're taking it to the next level. Man At Arms: Reforged does a mash-up of classic weapons. The first one they're doing is Wolverine's claws and Batman's Batarang. Every other Monday this summer, our team of blacksmiths and craftsman will be taking some of your favorite characters and items to mash up into brand new hybrid weapons that you've never seen before. This week, they will mash together Batman's batarangs with Wolverine's claws! It's an amazing piece of craftsmanship. 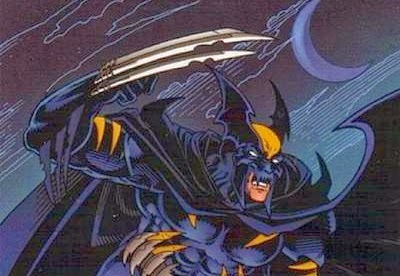 There actually is a Wolverine\Batman character in the comics called Dark Claw and I'd like to put my vote on the petition for a Dark Claw Batman\Wolverine mashup film. Who else is with me?! What do you think of the video? Would you watch a Wolverine\Batman movie? I think the Azrael Batman of the 90s was the closest to an in-continuity version of that character. That would be pretty badass though. NICE! Would I watch Affleck and Jackman square off? Why not! Incredible that there are skilled people who do that. Dark Claw, part of the Amalgam Comics line that spun off from DC vs. Marvel.